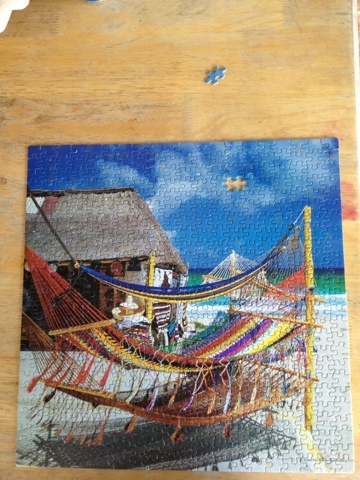 M blazed through our first Puzzle on the islands this morning! Nice work babe! I cant wait to start the next one. I had to work all day! Beach Hammocks - Cozumel Mexico. This is the first puzzle assembled in our new home! Hi Tom and Mercedes! I am so happy to have stumbled upon your blog. I found you through the Slater Family blog that I've been following for quite some time now. I saw your comment on his blog with the link to yours and thought I would check it out. I am always looking for fellow puzzle enthusiasts to talk with about something that has become a big passion of mine as well. Let me tell you a little about me. I am 38 years old, a stay at home mom of one three-year-old boy and another baby boy due in August. I love doing jigsaw puzzles, and have off and on since I was a child. Up until I purchased the huge “Life” puzzle, I had never completed more than a 1,500 piece puzzle because I had no good place to leave the puzzle permanently until I could finish it. I used the dining room table, and inevitably, I would need the table back before the puzzle was finished, and most of the time I didn’t have the desire to take it apart and put it back together again. Then, I discovered puzzle rolls on a website and my life changed! I purchased one that held up to 3,000 pieces and I got started with a Christmas scene one that was 1,500 and another one that was a neat looking 2,000 piece puzzle of the Las Vegas strip. I never ended up finishing that one because I moved, and the puzzle roll got put on the moving truck accidently so I have no idea if there are pieces missing, and I’m just afraid to try and finish it in case there are…too much of a disappointment. In any case, about 4 years ago I was looking around just to see what the largest jigsaw puzzle was and that’s when I discovered the Life puzzle website, and fell in love. Even though the puzzle was massive, and the price tag almost as massive, I knew I had to get the puzzle. I spent three hours the first time on that website reading all of the Hall of Fame stories, and each one inspired me more and more. After much convincing, my husband finally let me purchase the puzzle, and on July 22, 2010, I ordered it and began my own puzzle blog. Here is the link in case you would like to check it out. If you do decide to check it out, go to the archive section on the right, and go to the ones marked 2010 first….this would be where I initially ordererd it and started working on it. I think it’s more fun to read it from the beginning than to just start where I’m at currently with the puzzle. I am having sooo much fun with the puzzle, and though I’ve now had it for close to 3 years, I am no where near being done, but a lot of things have contributed to that slow progress. The first and foremost one being my son was 5 months old when I purchased it so I was busy taking care of him, and then he was old enough to get to the puzzle so I had to put it away most of the time and only pull it out on occassions when he was asleep or out with daddy. Then, real life happened as well, and my husband and I moved, lived in a hotel for 8 weeks while doing a consulting assignment, and just had a lot of life events happening that kept me from the puzzle. However, on September 14, 2012, we finally moved into our new and final home in the Atlanta area. We built the house from the ground up, and in our finished basement I made sure that I had a “puzzle room” so that I could set the puzzle up one time and LEAVE it until I was finished with the section. So right after we got the house set up and dealt with the Thanksgiving holiday, I was able to set up the puzzle in its permanent home in the basement. It now sits on a piece of pressboard on top of a table that was cut to hold one section at a time. About a week or so ago I finished the first section and have just started on Section 2. Anyway, I have rambled on long enough I guess, but I was just so excited to see another blog that was so detailed (like mine) that I just had to send you guys a message. Hopefully we can start chatting and sharing our love of puzzles as we get to know each other. Hey Penny, Thank you so much for your comments! We are both reading through them right now and just were talking about how great it would be to have you guys come visit us. We could show you around St Thomas and PUZZLE!